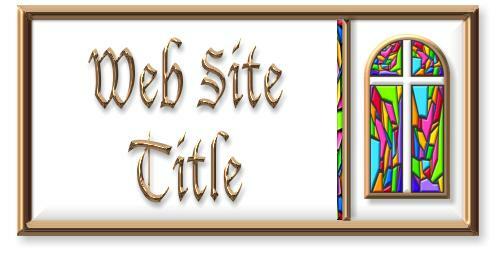 This is a Christian background theme page based on beautiful stained glass found in many Christian churches. Throughout its thousand-year history the term "stained glass" has been applied almost exclusively to the windows of churches, cathedrals and other significant buildings. The purpose of a stained glass window is not to allow those within a building to see out or even primarily to admit light but rather to control it. For this reason stained glass windows have been described as 'illuminated wall decorations'. Above you see a sample of how a web page title could be inserted into the stained glass title image created for this set. A blank of the title clip art is in the .zip file below. If you don't have a graphic program capable of inserting a page title, e-mail me and I will do it for you as time allows. Below you will find the Christian stained glass graphic divider and bullet designed for this page. Blank buttons plus samples are included as shown on the page in the zip file. Christian stained glass coordinating navigation graphics that could be placed at the bottom of each page if appropriate are also included. Many large windows have withstood the test of time and remained substantially intact since the late Middle Ages. In Western Europe they constitute the major form of pictorial art to have survived. The design of a church window may be non-figurative or figurative. It may incorporate narratives drawn from the Bible, episodes from the life of Jesus, or represent saints or patrons. In Early Christian churches of the 4th and 5th centuries there are many remaining windows which are filled with ornate patterns of thinly-sliced alabaster set into wooden frames, giving a stained-glass like effect. Font used for the sample title and buttons above is called: "Lucidia Blackletter"
To save, you may download the .zip file which includes the Christian stained glass graphics, clip art, instructions and HTML template. Do not link to the graphics on this page! Please note that this set is free to use on personal websites only (donations are always appreciated). Those sites that hope to generate income (business site) there is a one time $10 minimum requested donation payable through Pay Pal. Christian web theme set courtesy of Crystal Cloud Graphics.